The xiphos was not the only sword that the ancient Greeks used. They also favored the kopis, a remarkable little blade that hit with the speed of a sword and the weight of an axe. And that design has been recreated for you today in this Cobra Steel Kopis. The kopis is a surprisingly efficient blade that excels at both cutting and stabbing. The forward-swept blade and wider tip puts weight and mass behind every swing, making the leading edge of the sword just fall right into a target as though it were a heavy axe, allowing this deceptively small blade to deliver a wickedly hard chop. And the point aligns well with the wrist, which means it is frighteningly easy to turn a cut or a swing into a lethal thrust, too. This kopis is made for rough use, featuring a blade crafted from high carbon steel that features a razor-sharp factory honed edge. The sword also features full-tang construction, which means that it is quite durable and strong. The final touch comes in the form of hardened rubber scales, fitted around the blades tang, which ensures the blades grip and makes it a breeze to handle in virtually all situations. Included with the sword is a high quality black leather sheath that features a belt loop for easy carrying and transportation. The sword measures approximately 22 inches long, while the blade measures 16 inches long. 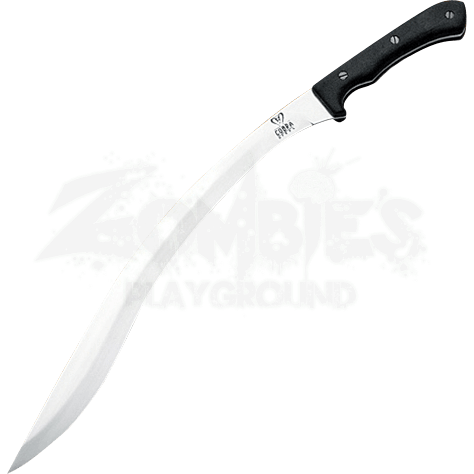 Rarely is a blade as deceptively efficient and effective as this Cobra Steel Kopis, and there are not many better weapons you could choose from to have at your side, either as a self-defense blade or as a ruggedly effective survival knife. Overall Weight: 1 lb. 4 oz.